This woman is surrounded by tranquility as she paddles her canoe on Rock Lake in Algonquin Provincial Park in Ontario, Canada during the sunset hours. The Autumn colors of the wilderness show their reflections across the calm surface of the lake along with the mirror image of the canoe and the woman. 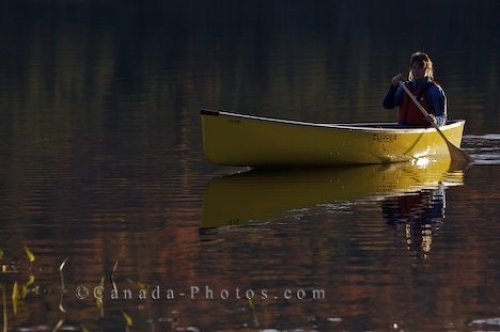 Picture of the Autumn reflections in Rock Lake in Algonquin Provincial Park in Ontario as a woman canoes at sunset.